ALBUQUERQUE – Young archers from Albuquerque Institute for Mathematics and Science, Garfield Middle School and Maggie Cordova Elementary School won their respective divisions May 12, capturing team titles in New Mexico’s first live National Archery in the Schools state tournament. Ten 15-member teams participated in the event at the New Mexico National Guard Armory. Competitors in the high school, middle school and elementary school divisions shot 30 arrows, 15 each at 80-centimeter targets 10 meters and 15 meters away. The top teams in each divisions received trophies. The top two archers – one boy and one girl -- in each division received brand new compound bows and a set of arrows. 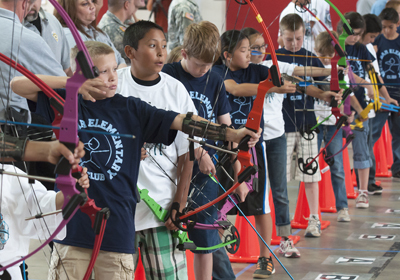 This is the fourth year the Department of Game and Fish has coordinated the National Archery in the Schools Program in New Mexico. Previous tournaments were “virtual tournaments” in which teams shot at their respective schools, and then submitted scores online to be compared with others. The date for the 2013 tournament has not been announced, but it will be earlier – in time to send the winner to Kentucky for the National NASP Tournament in May. Individual archers were shooting for a perfect score of 300. In the high school division, Joaquin Romero was the top male archer with a score of 269. Lily Perez took the top female prize with a 265. Both archers represented the Albuquerque Institute for Mathematics and Science. In middle-school competition, Angelica Avila scored 271 for top honors. Her teammate from Garfield Middle School, Andrew Leon, won the boys prize with a 252. Elementary school competition saw Desmond Williams of Maggie Cordova Elementary take the top male prize with a score of 241. Erin Mantch of Cottonwood Elementary won the girls prize with a 173. Here are the scores in the team competition, which included male and female shooters on each team. Fifteen archers competed for each team and the top 10 scores were tallied for the final total. Teams were shooting for a perfect score of 3,000. High schools: 1st, Albuquerque Institute for Mathematics and Science, 2,384. 2nd, Albuquerque Early College Academy, 2,172. Middle schools: 1st, Garfield Middle School, 2,300. 2nd, Carlos Vigil Middle School, 2,199. 3rd, Truman Middle School, 1,834. 4th, Van Buren Middle School, 1,754. 5, Washington Middle School, 1,224. Elementary schools: 1st, Maggie Cordova Elementary, 1,766. 2nd, Seven Bar Elementary, 1,722. 3rd, Cottonwood Elementary, 1,537. The National Archery in the Schools program has grown to 55 participating schools since the Department of Game and Fish began sponsoring it in New Mexico four years ago. It costs about $3,000 to outfit a school or organization with bows, targets, backstops and other equipment to get a program started. The Department splits the initial cost with schools and provides training for archery instructors. Many schools incorporate the program into existing physical education classes. The program currently is in 55 schools across New Mexico. Another 45 schools are scheduled to start the program as soon as they receive equipment and training. Schools or organizations interested in participating in the National Archery in the Schools program can find more information by contacting Brian Guzman, (505) 231-4375 or brian.guzman@state.nm.us.